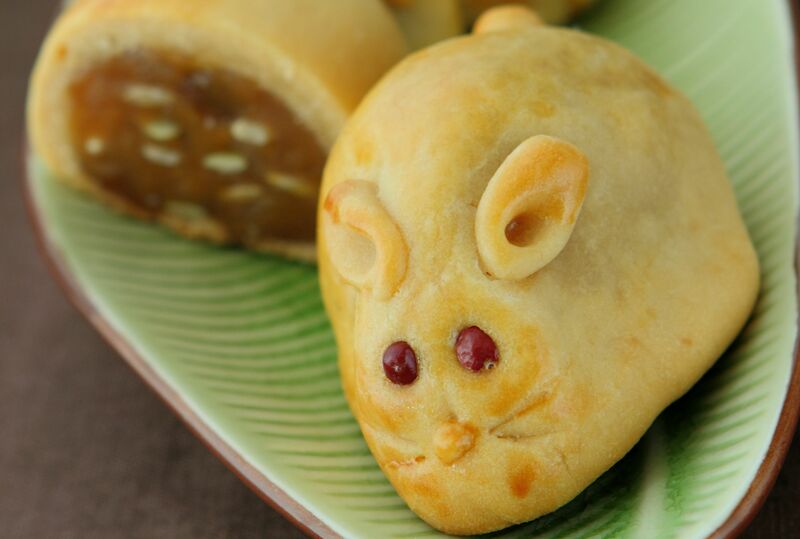 These bunny mooncake biscuits are a nod to the Chinese folklore about the Moon Rabbit. They feature the traditional lotus paste combined with the flavours from mandarin peels and sunflower seeds. This recipe was first published in Flavours magazine. Mix golden syrup, palm oil and alkaline water, cover with cling film and rest for 1 hour. Sift flour over and mix into a dough; cover with cling film and rest for 1 hour. Divide into 80g portions. Mix ingredients together and divide into 70g portions. Press each dough ball into a circle. Place the filling in the centre and wrap dough around filling. Shape into a teardrop. Shape narrow end into the bunny’s head: form 2 small teardrop shapes from dough and make them into ears (brush with water to stick). Form eyes with the red beans. Form the nose and tail from dough and stick on with water. Pre-heat oven at 170ºC. Place bunnies on a greased tray, brush with egg wash and bake for 16 minutes. Cool before storing.